Lanza Hair Color Dye: is it worth it? 9 comments | First published October 5, 2017 , last updated April 8, 2019 . Reading time: 3 minutes. Lanza haircolor promises coloring that heals, seals and protects. We’re here to bring you a neutral review of Lanza hair color products. Are they worth a shot, should you try them? We’ve picked three different kinds of hair care products that we swear by. If you’re not familiar with it, Lanza is a professional haircare brand that focus on color and care specifically designed for colored hair. All their products focus on nourishing hair for a long lasting color. Importantly, Lanza does not test on animals and is designed by and for professional hair stylists. This is a ultra-healing treatment for damaged hair, offering deep conditioning. It has essential amino acids and Ceramide-2 for proper color protection. Additionally, it prevents color fading from all 3 UV rays: UVA / UVB / UVC. As a result, hair color stays true and radiant longer – even the brightest reds. Trauma Treatment makes your hair soft and light, being also extremely good in reducing split/dead ends. Since you can use it as leave-in or rinse-out treatment, it ends up being a very versatile treatment. If your hair is wavy, curly, and dry, you can benefit the most from Trauma Treament. If you’re looking for your hair to grow faster, this will be a great ally as well. Besides, your hair will smell wonderfully! Our second pick is an oil hair treatment that ultra-heals because of its Keratin Protein and Phyto IV Complex, combined to leave hair incredibly soft and smooth with a healthy, radiant shine. This treatment will replenish optimal moisture while restoring elasticity and shine at the same time. It wont leave your hair oily, although a tiny amount will be enough to make your hair smooth and shiny. Looking for a product that will end frizz? This one is for you too. It is best suited for thicker hair, although it is designed for all hair types. It is definitely worth a short! With CP Anti-Aging Complex and Keratin Healing System, this serum strengthens hair that has become weak and brittle from chemical processing, heat and age accelerators. It adds instant shine & softness while strengthening hair. Fiber integrity is restored, resulting in healthier hair. Its non-greasy formula makes sure it won’t weigh hair down. This serum will hydrate all hair types. Basically, it leaves your hair silky, smoothing, and smelling great! Who wouldn’t want that? Colored hair tends to become dry, frizzy and coarse. Lanza hair color line will make your hair healthier and stronger to fight against the damage that heavy products and coloring do to your hair. Since it is a professional hair care line, all lanza hair products are naturally pricier than the ones you can find in any drugstore. However, that also means they are much better. With all of these three picks, you just need to use a little bit of product, so they last a long time too. They are definitely worth a try! Is it possible that Lanza hair color can cause hair loss? 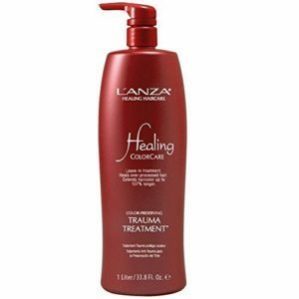 I have very fine hair and since using Lanza I have noticed drastic hair loss. I have no health problems that is causing the hair loss and my hair started to get thinner and thinner since my hair dresser started using Lanza hair color on me. I have never experienced hair loss problems from Lanza colors. You might consider looking into a coincidental interruption, around the same time, that could be the culprit. Eating habits, medication, stress, thyroid ect…all or a combination of these things can cause hair loss. Also surgery( anasticia) or a major trauma that can bring on sudden stress! I use the stimulating line & scalp treatment for my hair loss. Will the scalp treatment leave the hair oily? Plus in time will your scalp get dried out. So sorry to hear that was your experience:( As with any hair coloring treatment, many factors can go wrong… we hope you’ve find a better sollution for your kind of hair. It is terrible you had the experience with your hair stylist. I do not feel you can blame a product because one person did it wrong, I would try a different salon first.